One perk of being a blogger is being sent out products and it's nice to pass them on to friends for their thoughts too. Hi everyone! I’m Amy, one of Clare’s cake club pals and she has asked me to do a guest review for her of the Taste Collectiv’s new sauces. She’s been rather occupied with the gorgeous Ethan and given that I love pesto and a foodie challenge I was happy to oblige. We went to the BBC Good Food show in Harrogate recently and saw the gorgeous packaging of these sauces. The Taste Collectiv is a small company that actually launched at the Harrogate show. They have really thought about conveying the style and sights of Spain and Italy in their Romesco and Pesto sauces. To try out the pesto sauce I decided to do a ‘bung it all together and hope for the best’ meal one night after Cake Club when I felt like lots of veggies. 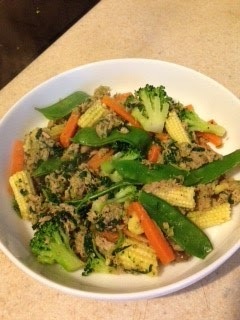 And by throw together I mean all I did was steam some vegetables, stick them in a pan with the pesto, add some tinned tuna and voilà! My pesto meal was ready. I just didn’t like it. I feel terrible, but having glanced at the ingredients list at the Good Food Show I saw that the first ingredient was parmesan as opposed to my usual Aldi pesto where the first ingredient is basil. I just don’t like a strong parmesan flavour. If I’m ever offered it for my food in an Italian restaurant, I turn it down. However, if you do like parmesan then this pesto would be great for you. Having tried the pesto and not liked it, I didn’t want to give the Romesco a go. So I’m sorry Taste Collectiv; your pesto wasn’t for me, but I am sure other people will love them. Thanks Amy for sharing testing out the pesto, sharing your thoughts and typing up this post. I would have loved to try it out but timing wasn't good and well... who can resist newborn baby cuddles? Thanks also to the Taste Collectiv for sending out the Pesto and Romesco to review.